Put the raw cashews, sun-dried tomatoes and soy milk in a sealable bag, squeeze out the air and refrigerate for at least 1 day (you can skip this step if you are using a Vitamix). In the bowl of a food processor or blender, add the soaked cashews, tomatoes and remaining soy milk into a food processor along with the nutritional yeast, coconut oil, miso, apple cider vinegar, tahini, mustard, paprika, onion powder, turmeric and salt. Process or blend until smooth and creamy, scraping down the sides a few times. You can add a bit more soy milk if the mixture is too thick and won't blend, but you want it to be as thick as possible. Meanwhile put 1/2 cup water and agar powder into a small sauce pan and bring the water to a full boil. Once the cheese spread is smooth and the agar mixture has boiled, pour the agar mixture into cheese mixture and process to combine. Put the spread in a ramekin, cover and refrigerate until you are ready to serve it. 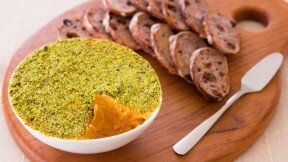 When you're ready to serve, uncover and sprinkle the minced pistachios on top to garnish.